My name is Richard Gibson and I train out of the McKenzie Lake Dojo. I just came back from a fantastic karate and travel experience in Japan. My travelling companions were Shihan Brad Gillespie, Sempai Michelle Gillespie and their 3 sons Max, Spencer and Leo; Steve Antonchuk and his wife Edita with their two daughters Rachel and Jordan; and my wife Cara and our daughter Rowan. In November of 2016 we booked flights to participate in the International Friendship Tournament in Japan on April 15th 2017. It would be my second time travelling to Tokyo but my first time competing. Rowan had competed in 2014 as did Steve (and Doug Shermack of the Calgary Dojo). Our plan this time was to compete in kata and then to spend a week touring the country. My katas were Saifa and Kanku. I practiced kata at home, at work, at lineups at McDonalds and pretty much anyplace there was spare moment. I know my teammates were doing the same. Yes, there were some strange looks from bystanders. The Calgary Cup and the Alberta Open were also perfect venues to practice in front of an audience. Conquering ones fears is part of the Kyokushin experience! Our departure day of April 12th was upon us before we knew it. 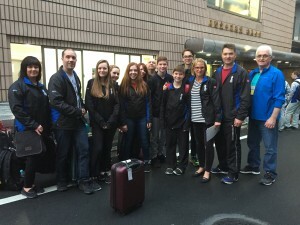 The 12 of us from Calgary, and Western Branch Chief Shihan Stuart, met at the Vancouver airport early in the morning and we flew across the Pacific and landed in Tokyo the next afternoon. After a series of trains we arrived in Honbu, the headquarters for Kyokushin Karate worldwide. It is a very small dojo with several floors. If you’ve watched youtube videos of Kancho Matsui demonstrating techniques it was probably filmed in Honbu. There were many competitors around the world getting their participant numbers. Shihan Stuart and Shihan Brad were greeted by many of them, including the officials at Honbu. Our team checked in, had a quick group picture outside of the headquarters, and then it was off to find our accommodations, some food, and adjust to the new time zone. The greater Tokyo region has a population of over 37 million people (greater than all of Canada). It is a sight to see and experience. People, restaurants, shops and trains are everywhere. However, the people are friendly, the streets and stations are excessively clean and the trains are extremely efficient. Google maps were a lifesaver for guiding us around. During our brief respite before the tournament we visited a number of landmarks including the Asakusa Shrine, Tokyo Skytree, the National Museum of Emerging Science (home of the dancing Honda Robot named Asimo), and the Toyota City Automobile Showcase and an amusement palace (the first of several sensory overload places we saw). The next day we made our way to the Tokyo Metropolitan Gymnasium, an impressive structure built in 1954 and used for the 1964 Summer Olympics. It has been modernized throughout its history and is being expanded for use in the 2020 Summer Olympics. The competitor and spectator lineup outside the main door went around and behind the building, easily thousands of people. Once we were through the main doors our support crew of Cara, Edita, Rachel and Jordan went up to secure seats in the stands. Shihan Brad, myself, Rowan, Steve, Michelle, Max, Spencer and Leo made our way down to the competition floor. It was awe inspiring to see the size of the venue with 11 rings set up for the tournament. Steve and I were participating in the Senior Kata division (35 years and older). We made our way to the ring and warmed up along with several other competitors. Some of them definitely had a presence; their practice katas were solid, flowing and accurate. I was feeling a little anxious about how this competition was going to work out. All competitors from all the rings were then lined up, and after an anthem and speeches, we were led in Kihon by previous world tournament fighters. That was an impressive way to begin the day! Our kata division was assigned a random starting order. I was fourth up! The first competitor went out on the mats, but the bow and start process was different than what I was used to. The second and third competitors went up and I still hadn't figured out how they were bowing and starting their kata. Then it was my turn, still trying to figure out what to do, I waited for the acknowledgement by the judge, shouted out my name and kata (‘Saifa’!). It was probably the wrong protocol but at least it sounded confident. The nervousness dissipated and I started my kata. I am happy to say that it was the best version of Saifa kata that I have ever done. No major mistakes and I put as much into it as I could. That feeling of ‘presence’ still eludes me but I am sure with time it will come. My scores were that of a beginner. I gained experience, as did Steve with his kata. When I watched the others performing their kata it occurred to me that the top place finishers were unbelievably accurate, the top 10 were very good, and the rest were human. They struggled with the same moves that I did. The saying ‘a black belt is a white belt who never gave up’ came to mind. It inspired me to work hard when I returned home and to go back to Tokyo in the future to compete again. The rest of the Canadian team had personal bests or gained experience as well. After that it was our time to be in the stands and watch the Friendship Tournament kumite and get ready for the World Weight Category Championship the next day. I could write pages of what that was like. The team katas had realistic combinations of precise kata and bunkai. The Russian teams took all three spots on the podium. There was an incredible kata demonstration by Rika Usami of the World Karate Federation. This guest kata was to highlight the collaboration of the two organizations to demonstrate karate in the 2020 Olympics. The World Weight Category spectators were anticipating exciting matches and the competitors did not disappoint. After the tournament was over, the Canadian crew experienced the food and sights of Tokyo, Kyoto and Osaka for another week. I hope to return to compete, learn and vacation there again soon. Thank you to Shihan Brad for the opportunity to participate. Thank you to our training and travelling partners and everyone at the McKenzie Lake Dojo who make it a special place to be every week. This entry was posted	on Sunday, May 28th, 2017 at 11:15 pm	and is filed under Uncategorized. You can follow any responses to this entry through the RSS 2.0 feed. Both comments and pings are currently closed.